Writer Stephen Smith is travelling through northern France as the world observes the centenary of the armistice that ended the First World War. In a series of blog posts, he shares his impressions with Canadian Geographic. Along with Winter’s questions, I’ve been weighing his advice — and, now, acting on it. There are many ways to honour those who served and those who died doing so: speeches and formal ceremonying are certainly some of them. Winter suggests going to memorials like the one at Beaumont-Hamel or Vimy the night before the politicians show up, if you can — spend some time there alone, let the quiet have its say. 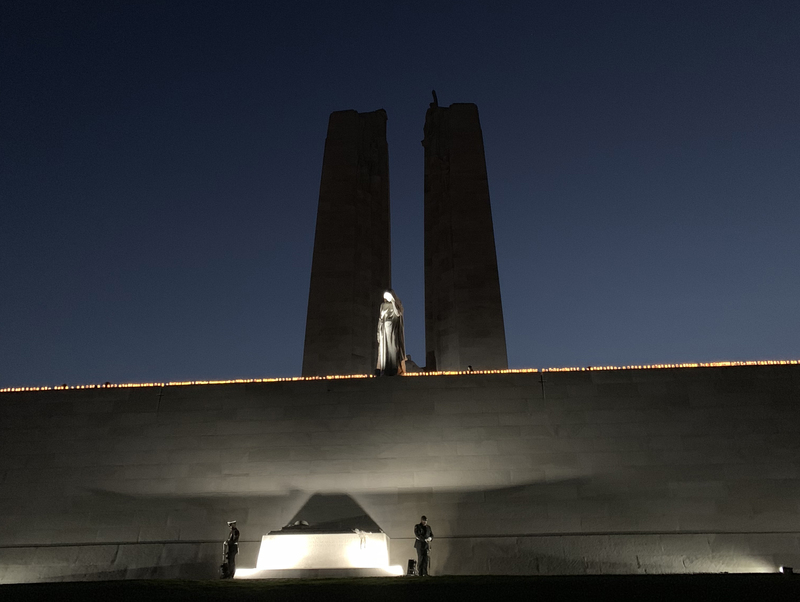 And so, with Prime Minister Justin Trudeau scheduled to visit the Canadian National Vimy Memorial on Saturday, I spent my Friday going to not-Vimy on not-the-day-the-PM-went. Officially, Farbus and Vimy are neighbouring villages, but the fact is they run almost together. If you leave Vimy’s cemetery and take three steps to your left, you’re in Farbus. I’d been reading about the battle there during the Vimy campaign, and looking at photographs showing how the village was all but obliterated when Canadian troops finished capturing it in April of 1917. There are no buildings in these photographs, only ruins of ruins, and smashed trees; I wouldn’t be surprised to learn that no brick survived that battle intact, and not a single leaf. Today, Farbus is hearteningly unshattered, rebuilt long ago to look like a village that never saw a war roar through it, as bustling as it wants to be — or not at all, as was the case when I showed up. I parked by the church of St. Ranulphe and walked up Rue de la Paix and in behind the school (it seemed to be a holiday) and up the hill in back to see if I could find a commanding view. I couldn’t; the trees of Farbus are too many. On the way back I stopped to talk to the only person I saw. 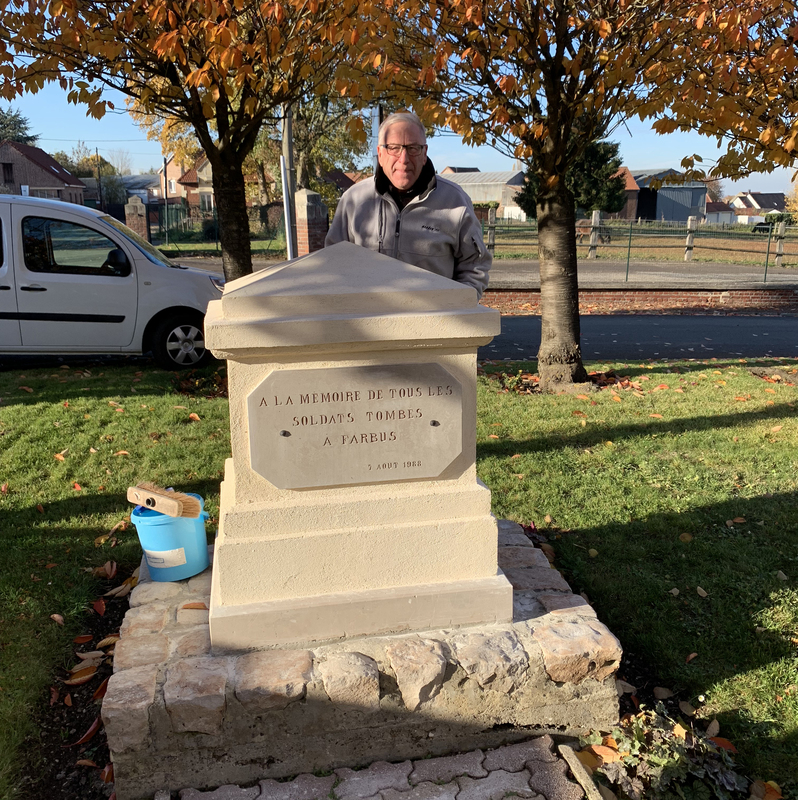 Jean-Claude was scrubbing a broomhead over the buttery-coloured stone of one of the village’s memorials ahead of the weekend’s ceremonies. We talked about the Canadians in 1917 — my broken French kept the conversation to simple statements bolstered on both sides by enthusiastic nods. “We’ll be ready for Sunday,” he said, as if he thought I might have been sent to judge his scrubbing. The mayor had just died, he confided; they’d only just buried him. Now it was up to the regional government to decide what to do about replacing him. I gave him my okay — that seemed for the best. I did eventually get to the Vimy Memorial, later. Park staff and Canadian soldiers were busy preparing for a pre-prime ministerial evening program involving Army bands and honour guards and a light show. But those were still a couple of hours away. I spent some time just trying to take in the magnificence of Walter Allward’s monument, and to balance the beauty here with the scale of the suffering that’s represented. There are 11,285 names etched in the limestone at Vimy that belong to Canadians killed in France whose final resting place remains unknown. I didn’t know what to say about that then, and I don’t now. I walked around the monument a couple of times, maybe more. The sun was high, Friday, and the blue of the sky up there looked like it might crack if you touched it, or departed this place without having made the effort to read every one of those names aloud.